The No. 1 overall pick in the 1992 NBA Draft took home Rookie of the Year honors by averaging 23.4 points, 13.9 rebounds and 3.5 blocks per game. 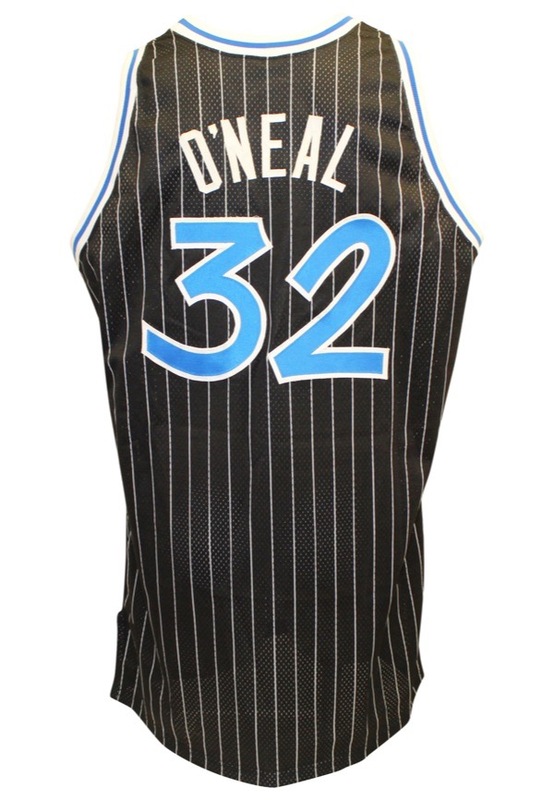 Shaquille O’Neal continued on towards a Hall of Fame career, which included four NBA Championships, three NBA Finals MVPs and 15 All-Star appearances. On the front left tail is the Champion manufacturer’s tag size “52” with washing instructions. 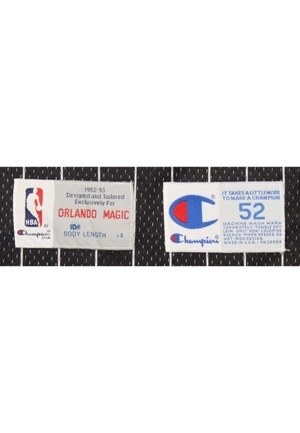 Adjacent is an additional Champion tag that reads, “1992-93 Designed and Tailored Exclusively For ORLANDO MAGIC ID# BODY LENGTH +4”. On the left inseam is a flag tag that reads, “100% NYLON”. On the upper left chest is the official “NBA” logo embroidered. Across the chest “Orlando” is screen-printed in white and blue and the “a” is a metallic silver star with a black-stitched border. The player number “32” appears on both the front and on the back in blue on white tackle twill. 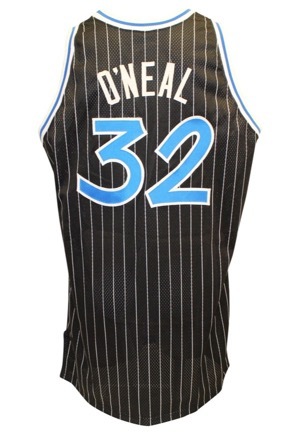 Across the back reads the player name “O’NEAL” in white tackle twill sewn directly onto the black pinstriped mesh jersey. There is sweat staining readily apparent in the collar and in the name on back. This jersey is properly tagged, was presented to us as game-used and in our opinion shows excellent use. Accompanied by a Milwaukee Bucks employee LOA.